Botany: Viḍaṅga is a large climbing shrub with long slender branches, long internodes, and the bark studded with lenticels. 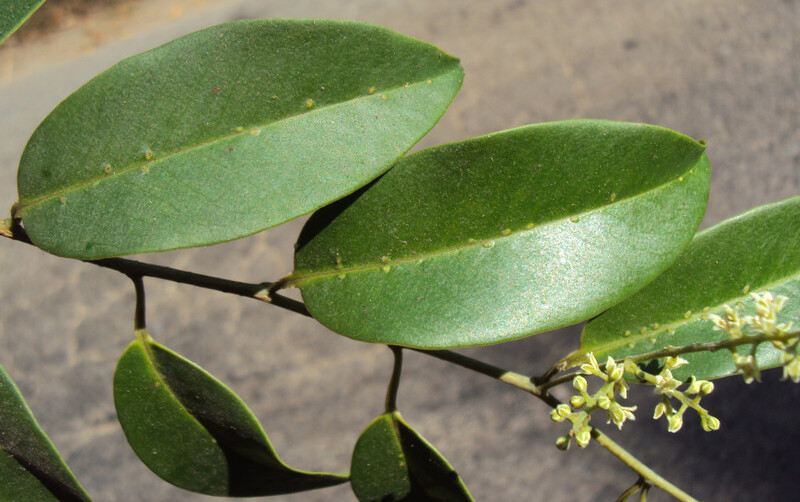 The leathery leaves are simple, alternate, ellptic-lanceolate, obtusely acuminate, shiny green and glabrous above, silvery below, with scattered, minute sunken glands. The small white to greenish white flowers are borne in terminal and axillary panicled racemes, the calyx five-lobed, the corolla hairy, with five stamens. The fruit is a smooth globose berry, comprised of a thin reddish colored pericarp containing a single seed. Viḍaṅga is found in forested hilly areas, from the Himalayas southwards into Tamil Nadu, Kerala and Sri Lanka, as well as throughout S.E. Asia (Kirtikar & Basu 1935, Warrier et al 1994). • Karma: dīpanapācana, bhedana, kṛmighna, jvaraghna, mūtravirecana, raktaprasādana, kuṣṭhaghna, vedanāsthāpana, saṃdhānīya, kaphavātahara (Dash 1991, Srikanthamurthy 2001, Kirtikar & Basu 1935, Warrier et al 1994). Toxicity: Embelia ribes has been reported to possibly cause optic atrophy among the Ethiopian population. Researchers examined this potential by feeding newly born chicks the crude herb in both high doses (5 g/kg/day) and low doses (0.5 g/kg/day), along with regular chick feed. Treatment with E. ribes was found to dose-dependently reduce the peripheral field of vision, and interfered with visual discrimination tasks. Researchers compared these effects with the administration of purified embelin isolated from E. ribes, and found that these effects were mimicked, suggesting that embelin may be responsible for the visual defects. Anatomical evidence of degeneration of ganglion cells was found in retinae exposed to high doses of E. ribes but no retinal lesions were detected in chicks following treatment with cumulative doses of less than 5 g/kg per day (Low et al 1985). Potassium embelate, or 2,5-dihydroxy, 3-undecyl-1, 4-benzoquinone, isolated from Embelia ribes was subjected to toxicity evaluation which included subacute, chronic, reproductive toxicity testing and teratological investigations in laboratory mice, rats and monkeys. The results did not indicate adverse effects suggesting that potassium embelate is a safe compound (Johri et al 1990). Researchers report that equal parts powders of Embelia ribes, Piper longum and borax fed to pregnant rats resulted in low birth, with cases of herniation of the intestines into the umbilical cord, with mothers gaining less weight during gestation (Chaudhury et al 2001). Contraindications: Pittakopa; pregnancy, diarrhea, bowel inflammation. Medicinal uses: Viḍaṅga has many uses in Āyurveda but most importantly is used to dispel intestinal worms and fungal pathogens such as ringworm. It is,, however, a comparatively pleasant remedy, and the dried fruit could even be chewed like pumpkin seeds if it weren’t for the acrid, burning sensation that occurs in the back of the throat shortly after ingestion, reminiscent of black pepper. In most instances about 8-12 g of the seed will be powdered and administered with honey, followed with a little warm water, taken first thing in the morning on an empty stomach. No food is taken for the entire day, and the next morning castor oil is taken to expel the dead worms. One recipe that is reputed to “destroy all worms as a thunderbolt does demons” is Viḍaṅga ghṛta, prepared by decocting 24 parts Triphalā, eight parts Viḍaṅga and one part Daśamūla in 128 parts water until the quantity of water is reduced to one-fourth of its original volume. The decoction is then strained and mixed with eight parts ghṛta and some saindhava added in for good measure, and decocted until there is no water remaining (Sharma 2002), 3-6 g b.i.d.-t.i.d., taken with warm water. In the treatment of heart pain caused by parasitic infection the Cakradatta recommends a fermented gruel of barley mixed with the powders of Viḍaṅga and Kuṣṭha (Sharma 2002). In the treatment of ringworm Viḍaṅga can be prepared in mustard oil or applied as a paste, and applied topically. Beyond its use in parasitic infections,, however, Viḍaṅga is an important remedy in both vāttika and kaphaja conditions, used in dryness of the bowels, constipation, colic and flatulence as well as in kaphaja polyuria and obesity. Due to its pungent properties Viḍaṅga is an effective sialagogue and digestive stimulant, both the roots and fruit used in anorexia as well as a powder in the treatment of dental caries as a dentifrice. As a digestive stimulant used especially in inflammatory joint disease (āmavāta) the Cakradatta recommends a combination of Viḍaṅga , Śatapuṣpā, Marica and saindhava taken with warm water (Sharma 2002). In the treatment of severe colic the dehusked Viḍaṅga seed is reduced to a powder and taken along with equal parts powders of Trikaṭu, Trivṛt, Dañtī and Citraka, mixed into balls with jaggery, taken in the morning in doses of 3-5 g with warm water (Sharma 2002). In the treatment of constipation marked by hardness of the bowels, flatulence, colic and abdominal pain the Cakradatta recommends a cūrṇa comprised of five parts Viḍaṅga, four parts svarjika kṣāra (an alkali containing sodium bicarbonate), three parts Kuṣṭha, two parts Vacā and one part Hiṅgu (Sharma 2002). Mixed with equal parts Trikaṭu, Citraka, Bhallātaka, Tila and Harītakī, Viḍaṅga is used in the treatment of hemorrhoids, skin diseases, edema, constipation, intestinal parasites, anemia and poisoning (Sharma 2002). In the treatment of abdominal tumors (gulma) the Cakradatta recommends a medicated ghṛta prepared by decocting Viḍaṅga with equal parts Trikaṭu, Triphalā, Dhānyaka, Cavya, and Citraka, in milk and ghṛta until only the ghṛta remains (Sharma 2002). In the treatment of splenomegaly (plīhan) the Cakradatta recommends Viḍaṅga dikṣāra, comprised of equal parts Viḍaṅga , Citraka, Vacā and flour, mixed with ghṛta and reduced to ash, taken with milk (Sharma 2002). Mixed with equal parts Harītakī, Śūṇṭhī, Trivṛt, Marica and saindhava, Viḍaṅga is mixed with cow’s urine and used as a purgative in virecana therapy (Sharma 2002). Although used mostly for its bhedana properties, Viḍaṅga mixed with purified Ativiṣā, Mustaka, Devadāru, Pāṭhā and Indrayava, with six parts Marica, used in the treatment of diarrhea with edema (Sharma 2002). The root and bark of Viḍaṅga are used similarly to the seed, applied topically as a counter-irritant in joint disease, rheumatism and lung congestion. The freshly chopped leaves or leaf juice can be applied topically in the treatment of skin diseases and wounds. • Cūrṇa: 3-12 g b.i.d.-t.i.d. Srikanthamurthy states that Svarjika kṣāra is obtained from the ash of various plants, including some species of seaweed and the tree Salsola kali. Svarjika kṣāra is stated to be inferior to Yavakṣāra, or the ash of barley seed (Hordeum vulgare) (2001, 202).